Too many swings and a misses or foul tips can seriously degrade the life of your batting cage net, forming a hole right behind the batter. Those batting cage nets aren't cheap; protect yours with this 4 foot by 6 foot Cimarron Vinyl Backstop. 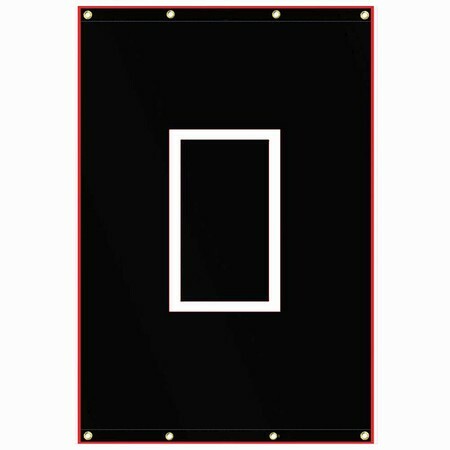 Featuring a strike zone target, the Cimarron Vinyl backstop is great for protecting your cage and it makes lining up a pitch from your pitching machine easier, too. Not only that, but it is great to use with pitchers, giving them the perfect target to practice their pitches. With four sets of grommets, it's super easy to clip this batting cage backstop to your net. Ultra portable, roll it up and take it anywhere there is a cage or net!